Bought a new Laptop and it doesn’t give you the kind of battery backup that you wished for? Well the fault is not in the Laptop that you bought. The fault is basically in you on how you manage it efficiently so that you can have enough batter backup. Read along this Gadget Guide on How To Increase Laptop Battery Performance to know more. Set the brightness of the LCD screen to a minimum level where you are able to view properly and you can do it by going to Windows Control Panel. Never use extra icon pack. They may make your desktop look good, but it reduces performance of the battery. Just use regular icon. The next very important thing is that most of the people leave behind CD/DVD in DVD-ROM drive when it is in no use. Even if it is not playing but it still inserted in ROM and Laptop still consumes a little power from battery to make it active all the time. 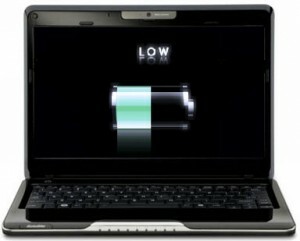 When battery charge is at the lowest level then you must avoid using any USB devices. Now this is universal fact that if you connect any iPod or Smartphone in Laptop via data cable, they automatically consume charge from laptop and start to charge themselves. So avoid using these products when battery is in low state. Don’t use internet when battery is too low. Prevent any auto startup program. Always check laptop cooling system because it must not get heated up all the time. You must clean Air Vents on regular basis. This is really helpful. 🙂 Some tips do say that its better to remove the battery if the laptop has power (charger is plugged), do you recommend this? never heard of such tip. And i dont recommend this tip as sudden high voltage may directly affect your Laptop.